Anderson Cooper has extended his relationship with CNN and confirmed his plans to move forward with a daytime talk show. “I remain as committed as ever to my program on CNN, and will be with CNN for years to come,” Cooper added. The New York Times reports that Warner Brothers confirmed that Cooper has signed on for daytime talk show, which will be shopped around for debut in fall 2011. 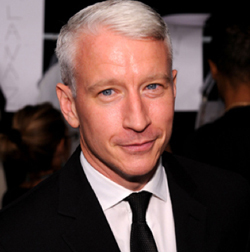 Original Post: Anderson Cooper is “deep in talks” for a daytime talk show, The Hollywood Reporter’s James Hibberd reports. Cooper, who is CNN’s leading newsman, is reportedly “close to a deal” with Telepictures Productions and Warner Bros. Domestic Television Distribution for a daytime talk show to air in fall 2011.
Cooper regularly sits in for Regis Philbin on “Live! with Regis and Kelly,” where he’s proved he’s can try on new glasses or call himself a loser and is as capable with lighter topics like human mattress dominoes, reality TV and exercise segments as he is with the crisis situations he’s built his career on.